Enova Decisions provides automated real-time decisioning services to businesses operating primarily in loans and banking. The parent company has gained over a decade of experience automating many of the decisions relevant to these markets, and has effectively productized its skills and experience in a set of services. These employ predictive analytics technologies to improve the accuracy of tasks such as fraud detection, credit rating, customer data verification, collections and product recommendations. The platform that plays host to these solutions is called Colossus, and is typically accessed as a cloud service through an API, although it is also possible to implement on-premises through a custom installation. The models used to execute tasks such as credit scoring, fraud detection and so on can either be those developed by an organization, or models developed by, and in conjunction with Enova Decisions. The platform scales to pretty much any need and it’s cloud version is deployed on Amazon Web Services. It can also ingest models written in SAS, R and Python, with support for PMML (Predictive Model Markup Language) expected in the future. Enova Decisions seems fairly determined to avoid consulting based revenues, and even offers ongoing consulting free-of-charge. The pricing model is based on usage, and particularly the number of decisions executed. What makes Enova Decisions interesting is the fact that the parent company has been in the online lending business – 11 brands in six countries – for over a decade, and as such knows what works and what doesn’t. Embedding this experience and know-how within a set of solutions should be attractive to businesses operating in similar environments. Other industries (telecommunications for example) grapple with similar decision processes, and will find decisioning solutions such as collections, fraud detection and product recommendations attractive. The service was launched early 2016 and has already attracted customers. It is expected that additional solutions will be offered (predictive sales for example), and that the platform will eventually appeal to a variety of industries. Enova Decisions Smart Credit – supporting improved credit decisions with risk and credit scores. Particularly effective in the below-prime segment. Enova Decisions Smart Offers – optimizes offers and targets product recommendations. Smart Retention – predicts customer profitability, loan-to-value, and likelihood of customer retention. 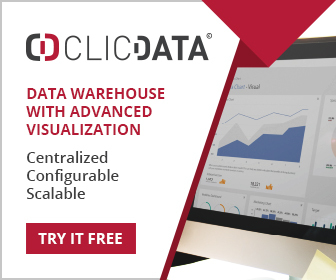 Smart Collections – improves recovery through collections optimization. Enova Decisions Smart Alerts – flags potentially fraudulent applicants. Smart ACH – improves debt practices to optimize overall clearance rates. Smart Verification – reduces fraud through real-time identity, account and document verification. The Colossus platform is essentially a web service allowing businesses to transmit transaction details and receive a score , prediction, or decision in return. Implemented using Amazon Web Services, it inherits its scalability, security and resilience. This is a real-time environment, typically with millisecond response times, and support is provided for models written in SAS, R and Python. The platform itself is written using the Wolfram mathematical language. Most machine learning techniques are supported, including logistic regression, random forest (with boosting and bagging), neural networks, support vector machines, decision trees and related methods. If an organization already has a library of models, these can usually be migrated to Colossus with relative ease. Bespoke models can also be built, and Enova Decisions also offers a data study as a means of constructing and running a custom model. This allows potential customers to test the service before committing. Obviously Colossus needs to offer more than a raw predictive model and scoring execution service. Users need reports and status updates to ensure the various models are performing well and that unacceptable drift is not taking place. Various dashboards fulfill this function, displaying the results of decisions, model rating and distributions of scores. One aspect of Colossus that does need more development is that of model management. Again, the firm is aware of this and moves are afoot to beef up this aspect of the platform. Businesses deploying thousands of business rules will need some form of rules management system. 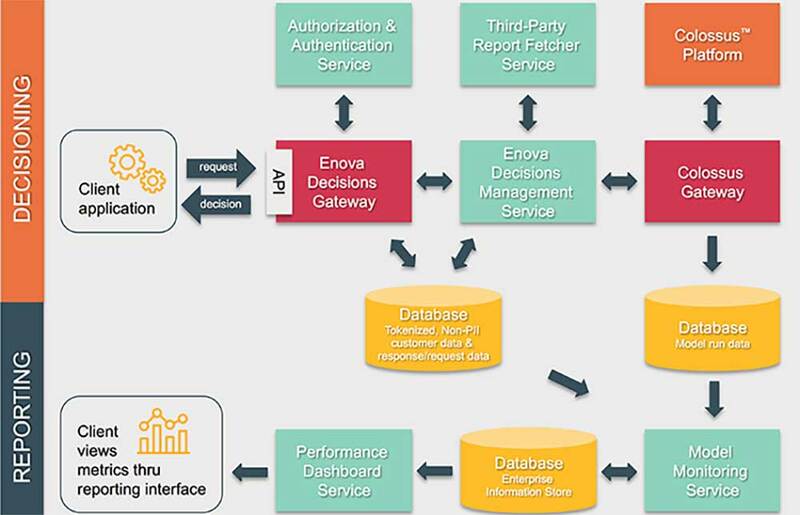 An application sends data to the API at Enova Decisions Gateway. The request is authorized and authenticated. If external data is needed, this is fetched as needed. All data and variables are assembled and passed to Colossus. The data and variables are run against the model and a decision produced. The result is sent to the calling application through the API. There is nothing particularly complicated here, and in any case Enova Decisions does all the necessary hand-holding to make sure the process flows smoothly. The most significant feature of the Enova Decisions solutions and platform, is the fact that the parent company operates in the loans market. This means hard won experience is built into various solutions and the approach is highly business focused. Many providers of predictive technologies are just that – technology suppliers. Enova Decisions on the other hand is primarily a solutions provider. Businesses wanting fast time to value, and a low overhead solutions set should at least consider Enova Decisions solutions and technology.